If you've ever worked with corporate zombies, then you've experienced The Takeover. Web designer Maureen and her friends struggle to adapt to their new work environment as coworkers from Zombinc, the zombie staffing company, come to work with them. 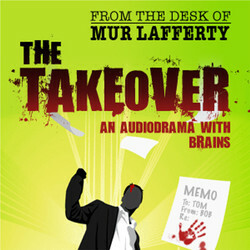 Language barriers, arguments over the contents of the work fridge, and what a "promotion" really means are all addressed in this "Shaun of the Dead" meets "The Office" audiodrama. We will send The Takeover to your Kindle at . The Takeover has been sent successfully to your Kindle!